I know I've mentioned this before, but I wanted to remind everyone of BundleHunt, a "choose your own bundle" collection of great apps, which includes Simon, my pro tool to monitor websites and servers for changes or failures. This bundle is coming to an end soon, so it's your last chance to get Simon and 6 other apps for just $19.99. Choose from 49 premium apps, including Typinator, MacJournal, WinZip, and more. You can get 7 apps for less than quarter the regular price of just Simon! If you already have Simon, this is a great opportunity to get your friends or colleagues hooked on its benefits for a very low cost. I'd appreciate any help in spreading the word, and if you use this link they'll know you came from here. I've just released a tiny update to Time Out, to fix a couple of issues. Version 2.2.1 includes a fix for scheduling issue, where it was incorrectly adding the sleep duration to the due time after waking from sleep. It also includes a fix for breaks set to a frequency of daily (or longer) and with an Available time range set, where it was pushing the due time out by a day. If you are using the Mac App Store edition, you can update via the App Store app once it has been approved (maybe later today or tomorrow). Otherwise, download Time Out 2.2.1 now. I'm pleased to announce the general release of version 2.2 of Time Out, my popular break reminder tool. The major new feature of version 2.2 is the new Activity page. It also includes new themes and theme features, a View menu for easier navigation, and several other improvements. Read on for details. This feature is available as a reward for current supporters. If you were a supporter in the past, but it has expired, you can extend your supporter status to use this feature. As with other supporter rewards, you can also try it for an hour at a time. Added a View menu to the menu bar, to enable easier navigation of the preference pages (the keyboard shortcuts can still be used when the menu bar is hidden). Added an alert when turning on the option to automatically start Time Out, if the app isn't in the Applications folder. When using a MacBook Pro with integrated and discrete GPUs, now attempts to remain using the integrated GPU, to save battery. Now remembers the visibility state of the Preferences window. If you close it, it will remain closed when you next start the app, or if you leave it open, it will re-open. The window will always display when later switching to the app, when the Dock icon is shown. Otherwise, download Time Out 2.2 now. I've just released a third beta of version 2.2 of Time Out. Again, the major new feature in version 2.2 is the Activity page, where you can see what breaks you've taken (and for how long), and what apps you've used, if you wish. As mentioned recently, I had an issue with the Dejal server that prevented people from registering for accounts on the site, and thus new people were unable to create forum posts. After addressing this issue, I was (unsurprisingly) buried under an avalanche of spammer account registrations and spam posts, some of which appeared on the site, and were manually deleted by me as soon as Simon told me they were there, and some were automatically unpublished. For a day or two, I tried requiring approval when registering accounts, but that didn't really work, as I couldn't tell who was a legitimate customer, and who was a spammer, until they actually post something. So I am now trying another option: forum post moderation. Now, every new forum post will go into a moderation queue, requiring my manual approval to be seen publicly. This isn't ideal, since that means others couldn't help the author before I see it, but I usually see posts very quickly (again, thanks to Simon), and reply promptly. So it shouldn't have any real effect. We'll see how this goes. Hopefully this step should prevent any more spam. If it works out, I could extend things further to "white-list" people who have posted legitimate topics, so their subsequent posts bypass the queue. Wouldn't ya know it, I managed to slip in a bug in the first beta of Time Out 2.2, which caused it to crash on macOS versions before 10.12. Sorry about that! I've just released a fixed version. I've just fixed the issue that was causing an error when attempting to create an account on the Dejal site, which prevented people signing up to post in the forums. I've had a few reports of issues for a while, but hadn't figured out what the problem was until just now — it turned out to be a problem with the third-party spam detection software, caused by the server clock being out of sync. The forums have been rather quiet of late, in large part due to that issue. We'll see if it gets any busier. It has been nice to have a break from the endless spammers on the site, though. In fact, I have been wondering if I really need the forums, since few people have raised the issue, and even before that it didn't get much traffic. Most people seem to prefer to contact me privately, or via @dejal on Twitter (or an app-specific account like @DejalSimon or @DejalTimeOut). But I like to provide many avenues for support, to make it as convenient as possible for you, plus the community aspect where you can read other people's questions and answers can be beneficial, so I'll keep it going for now. Side note: I have thought about adding Slack to those options, for a more real-time chat. I enjoy participating in some Slack teams (like the Core Intuition Slack), but I'm not sure it's a great fit for software support. I'd welcome feedback on that if you have an opinion one way or another. Hot on the heels of my first iMessage app, Date Stamp, I'm pleased to introduce something else for iMessage: Chicken GIFs. These are my own chickens (Rhode Island Reds and Single Comb Brown Leghorns). They can be lots of fun to watch. For these stickers, I chose excerpts from videos of them that could be fun reaction GIFs. If you enjoy these GIFs, you can see more of the chickens on the Dejus YouTube Channel. Download Chicken GIFs from the iMessage Store! To celebrate the 10 year anniversary of the iPhone, I thought I'd repost this from a year ago. Happy birthday, iPhone! That sent me down a memory lane of my experience at that event. I haven't attended many conferences over the years, but Macworld Expo in 2007 was one of them. In fact, that was the only Macworld I ever attended. 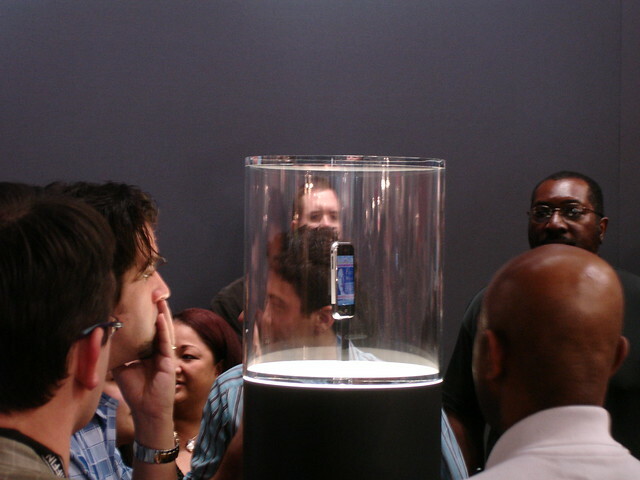 But yes, I was also in the audience for the historic occasion of Steve Jobs introducing the first iPhone. After the show, I wrote a followup blog post with my initial impressions of the iPhone and other news at the event (introduction of the Apple TV, and Apple changing its name). Reading over that post now is somewhat amusing, with concerns over the keyboard and developer access. 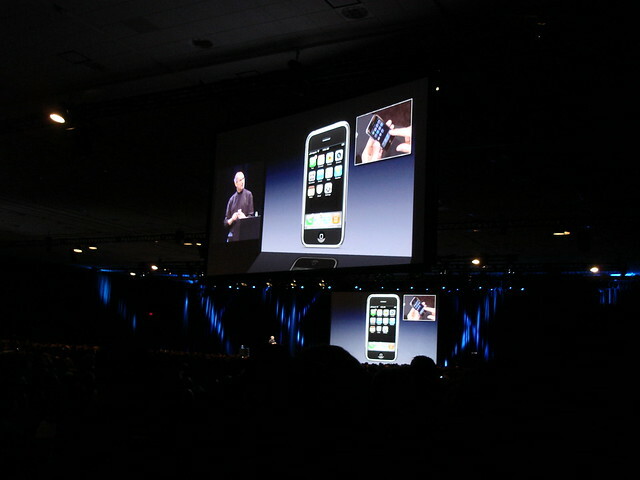 I had a bunch of other photos from the show, showing various events and presentations, the show floor, iPhone demos, etc. Ah, memories.